We are Cobalt Boat owners from around the world. This site is used by local groups to post their upcoming trips; any individual who owns a Cobalt can post their trips and pics here, and we can all share in that wonderful world that we have in common: Cobalt Boats. To post something, send an email to editor@mycobalt.net. That is my video! Pauls Cobalt Boat! My friend Willy was the clip director, aka the guy with the camera phone getting the free ride! The clip was taken on 05 Aug 07 on the Patuxent River at the mouth of river at Solomons Island, Maryland. Awesome! I have a Cobalt 223 that I purchased last year and I am looking for more info on it like year made and so on. I have a 1989 Cobalt 202. I’m restoring the boat for it’s 20th anniversary and need to replace the carpeting. It is a brown/tan color and I’m having trouble finding a replacement carpet that is 8.5′ feet wide and meets the Cobalt standard. Any sources would be greatly appreciated. CAN YOU TELL ME WHERE I MIGHT GET SOME FROM ? How do I change the email so I can get your emails to my new address? 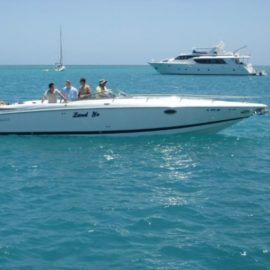 Hi, I am in Mexico Cancun, and recently I bought a Cobalt 272 1994, with engine 454 originally ( serial 4100144472 )and a transmission Volvo Penta, which was broken and I changed for Bravo 3 with propella pitch 22. Problem: AT Top Speed and with the trim light up the boat made 5200 RPM / 40 MPH , with pitch 22, I need to buy new propellers, But i am not sure to go to 26 or 28, I like 28, but I afried when the boat is with more of 6 passengers and strong sea, the boat can loose force and spend a lot of gasoline, in theory double propellers understand that represent each pitch 300 RPM, If I go to 28 I would leave at 4300 rpm, the original engine is 330 HP, and specifies that its RPM maximum would 4400 RPM, which seems perfect, But some friends said 26 is Better, I do not want to be out of the RPM Range , and lost Top speed. Here is very difficult to test with 26 or 28 proppellers, the dealers do not have. and I have to buy, please thenks for helpme to make the correct choice. hidraulic system failed, what way we can open the hood of the engine? I have a 2002 240. The latch on the head door is broken. Does anyone know who makes this stainless steel latch? Cobalt says they are out of stock, but can order one. There is a Cobalt part number of 411390 but the local dealership says its a $450 latch. My Cobalt has a flying carpet! (I couldn’t resist). Did you ever find a replacement?